Relatively speaking, there's not too many solitaire picks available on DSiWare. Europe and North America each have two: one title created by Nintendo themselves is the only one shared, while North America has Digital Leisure's offering and Europe an Engine title. This new release has the most variety yet, not just offering about 30 variations of standard solitaire, but also a completely different game mode. Solitaire is solitaire, so there's not much of a difference from any of the other titles in the regular game mode. There's a ton of versions on the game available, including the well-known Klondike, Spider and FreeCell, but also Four Seasons, Beleaguered Castle and more. All of these just offer slight variations on the rules, though, you'll mostly be doing the same thing in all of them. If you're not familiar with how solitaire works this game doesn't really offer a tutorial, although you can bring up one single screen with a few playing tips. Best study up elsewhere first if you're unfamiliar with the game and plan on downloading this. During each mode, you also have five hints at your disposal that highlight the card you should be moving next. You can blow through these very quickly if you're not careful, so don't rely on them too much! There’s no need to worry if you mess up your game however, GameOn have helpfully included an undo and redo button in the top-left corner of the touchscreen to rescue you on such occasions. The most interesting feature, however, is the inclusion of peg solitaire. Related to regular solitaire in name only, this is played completely differently. You can pick one of seven different boards, each of which as a number of holes, and all but one have a small ball on them. Your goal is to make the balls "hop" over one another, removing the ones that are hopped over and eventually only having one ball left, which must be in the centre of the board. Although there's only seven boards, each of them has a number of setup variations you can play. For example, you can play the plus-shaped board completely filled with balls, but you can also play it with only a fourth of the board covered. 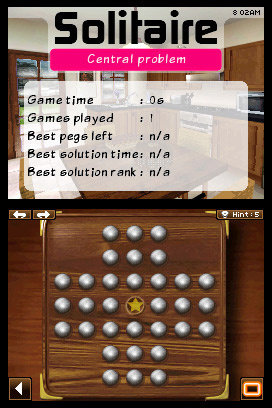 The game keeps track of your fastest solving times for each variation in case you're keen to improve on them. 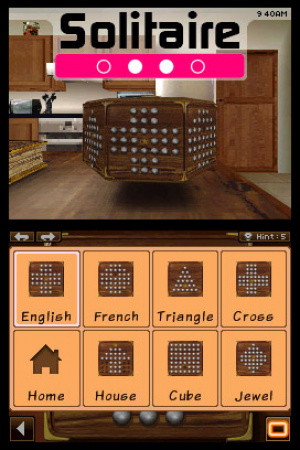 The game is understandably simplistic in terms of graphics and sound, but the graphics have a little more flair to them than the other DSiWare solitaire titles do, attempting to emulate the feel of actually playing these games on a table. There's not much different music, but what's there is decent and won't get annoying. There's nothing to do other than play solitaire and peg solitaire on your own, but with such a huge number of variations on the two games, especially compared to the other DSiWare offerings, you'll be entertained for a long time if you like either mode. That sounds pretty nice, pyramid too! Hopefully someone in Japan will pick it up for us importers! Cheers for the review Marcel. Cool, my Dad likes Sudoku. @ labrat7: And what does Sudoku have to do with this game? I wonder what the holdup is the the USA release. This looks waaay better than any of the existing Solitaire games on DSi ware. Cool! it comes out tomorrow and this one of the games on my list that i will buy for the DSiWare! The peg thing reminds me of the little games at the Cracker Barrel. O.o Which I can actually end up with 1, btw. The cards on this one seem satisfyingly large and distinct. I think this should get a good 8/10 for having so much. But unfortunately I don't know how to play solitaire.